To lose a son under those circumstances – a violent death like my son went through, it just puts a burden on your heart. 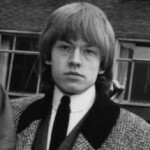 Brian Jones was born in the Park Nursing Home in Cheltenham, Gloucestershire, England. He was a british original bandleader of the Rolling Stones. Jones was a multi-instrumentalist, with his main instruments being the guitar, harmonica and keyboards. His innovative use of traditional or folk instruments, such as the sitar and marimba, was integral to the changing sound of the band. He developed a serious drug problem over the years and his role in the band steadily diminished.